As a Los Angeles family on-the-go our footwear style would best be described as sporty, trendy and casual. 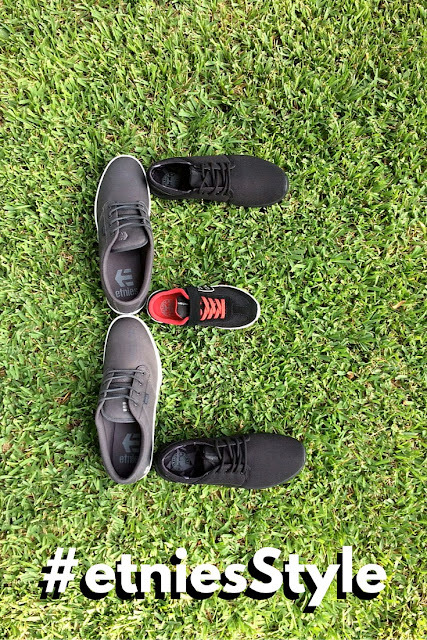 It's good to know etnies and etnies Kids has the entire family covered... literally. (See what I did there.) Whether we are hitting up the local theme park, heading to the beach or attending a sporting event, we depend on our footwear to be comfortable and fashionable. We want our shoes built to last, and our children's shoes built to withstand serious play. etnies Kids help keep boys and girls looking fresh, just like the pros in true skate style with their high quality products. Now that I'm working with etnies Kids, I was happy to learn about how the company is giving back to our planet. They aren't just nice to look at, these shoes have heart and sole soul. 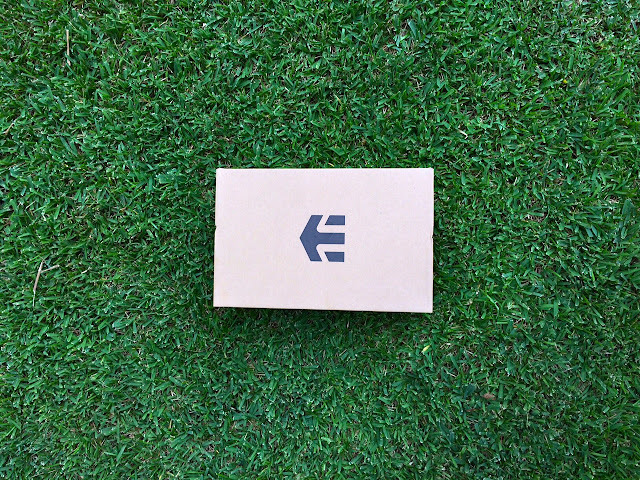 For every pair of etnies Kids’ shoes sold, a tree is planted with the Trees for The Future Foundation. etnies' reforestation program helps kids see that their happy feet means a happy forest. To date, etnies has planted well over a million trees. I just want to hug these shoes! If you're like me, you don't have a lot of time between the carpool line, work, making dinner, homework and extracurricular activities to go to the mall. I've got two words for you - online shopping! For a limited time visit amazon.com now through November 5, 2015 use the code SKATESHOES and save 20% on Amazon on your etnies. Music to any parent's ears. So they are saving the planet and putting money back in our pockets, I'm sold! The fall collections are here and they are super cool. It's hard to choose which style I like best between the Scout, Marana and Jameson collections. My gang is loving their new etnies kicks. They have a great variety of shoes for everyone in your crew. Your children will like that they really look (and feel) like the pros when they wear them. etnies are ready for action and can go from zero to sixty instantly which is perfect because it's exactly the speed my kids are going 99% of the time. I'm pretty sure your children aren't much different. This is how my family shows off their #etniesStyle. The ultra skate style of etnies Men's Jameson 2 Eco Skate Shoe works great for my husband. When he's not at work he likes to dress casual and wants shoes that will match his laid back style. Nailed it. Sleek black on black is the style for me. I need a shoe that is lightweight and all about comfort. The women's Scout active shoe fits like a dream. Seriously when I'm wearing mine, it feels like I have on slippers. Plus you can dress them up or down depending on what outfit you're wearing. Winning! I was happy to add a little sparkle to my college girl's life with the etnies Women's Jameson 2 shoe, so cute with the glitter. You can never have too much sparkle as far as I'm concerned and this adorable skate shoe proves it. The material looks like denim so it will match with almost anything she has in her closet. Total bae! The LO-Cut SC Skateboard Shoe is just right for my youngest daughter who is constantly in motion. She can run, jump, ride her scooter and these shoes will support her no matter what. Another bonus this type of shoe makes mornings much easier because it ties itself, literally. So I can finish making her lunch while she slips them on herself. She was so excited about her new etnies, she didn't even mind me taking her photo, that is one magical shoe! Yassss! It's your turn to get your hands on these sweet styles. You can enter this stylish giveaway for a chance to win $500 in etnies gear for your family. How rad would that be? Plus the holidays are right around the corner (don't remind me) and who couldn't use some free shoes and apparel. Good Luck! How do you show off your etniesStyle? Disclosure: This is a sponsored post. My family received shoes to help facilitate this review. All opinions shared on this blog are 100% mine and 100% fresh. Very nice read to your blog which is related to kids footwear. Thanks for posting this detail here.